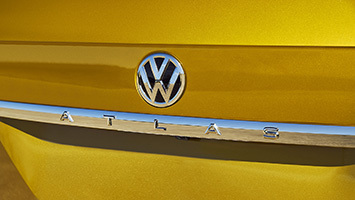 Volkswagen literally translates into English as "People's Car." Back in the 1930s, when Ferdinand Porsche was tasked with designing a vehicle for the masses, people wanted little more than durable and cheap. The Beetle fit that bill perfectly. Today, a car for the people – specifically Americans – needs to be big and relatively affordable. 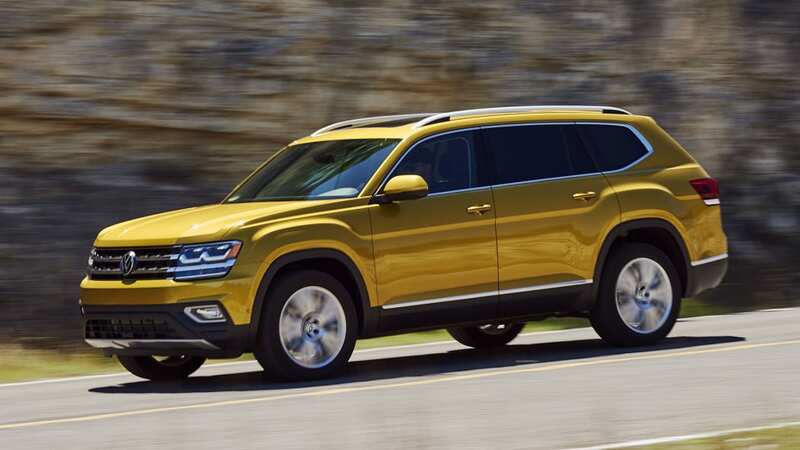 The 2018 Volkswagen Atlas nails those two bullet points, offering seats for up to seven passengers at a starting price of $31,245. Meeting that basic criteria means that VW probably has a sales success on its hands. Thing is, there isn't any one area where the Atlas stands out from the rest of the herd. 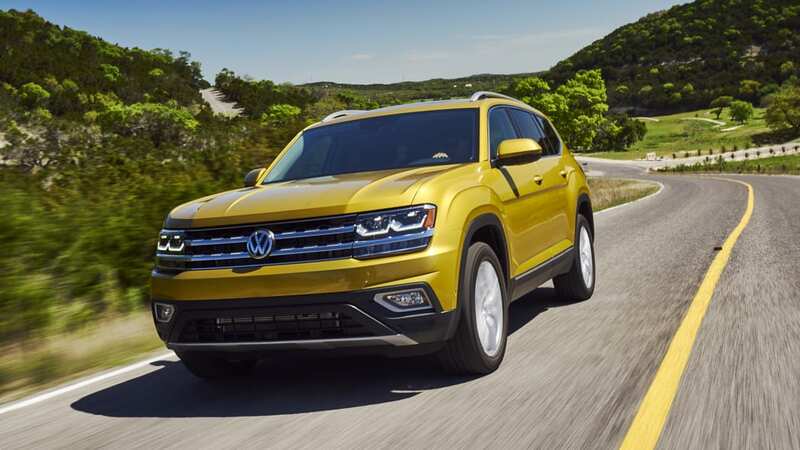 From its styling to its powertrain, it seems that Volkswagen is content to do the bare minimum to make a competitive crossover, and in this currently very crowded marketplace that's just not good enough to be a segment leader. 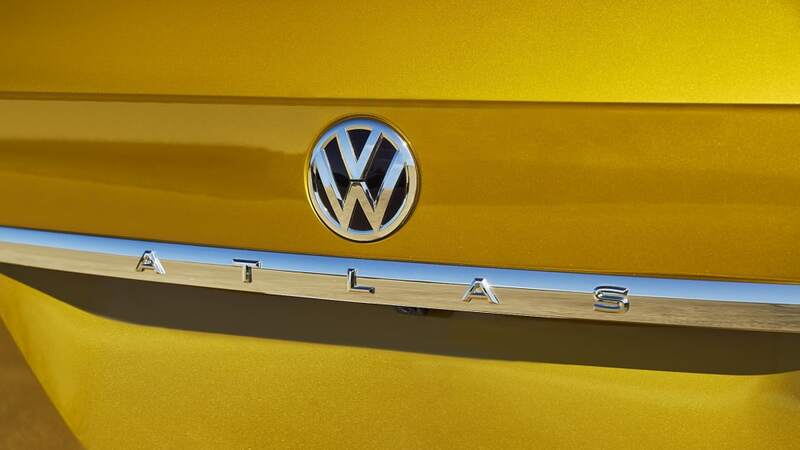 From the outside, VW has definitely erred on the vanilla side of plain, with just enough flourish to round off the Atlas' corners and make it more than just a basic box. 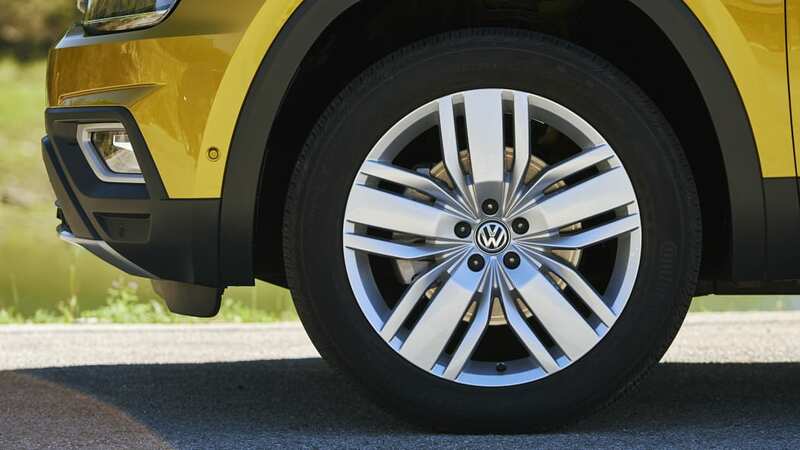 The slab sides are so massive that the optional 20-inch wheels look almost a size too small. On the positive side, indented kinks at the leading edges of the front fenders are a nice touch, and the bland but inoffensive styling matches that of the current Passat and Jetta models. 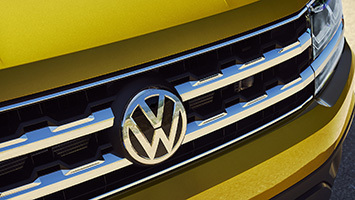 Clearly, this straight-line approach is what Volkswagen's stylists think Americans want. The pumped-up Passat theme continues inside, with a long and mostly flat dashboard and center stack broken up by a couple of silver-plastic and wood-trimmed panels. 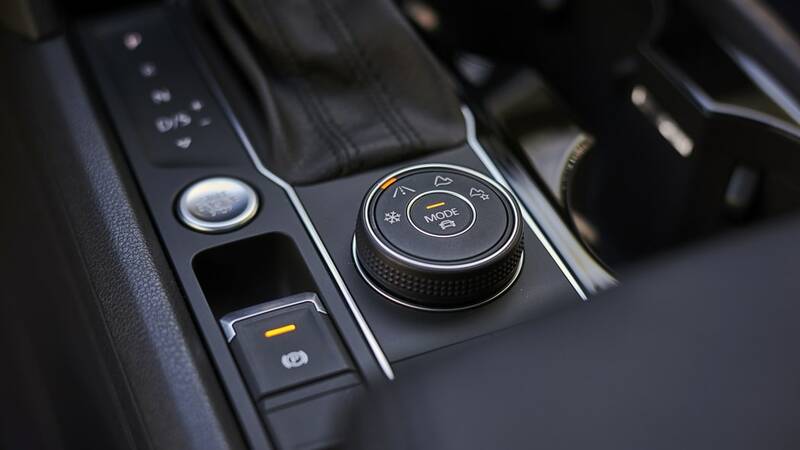 The good news is that most everything you'll need to mess with on a daily basis has a dedicated button, including a volume knob and three dials for the climate controls. But there's bad news for those who revel in premium materials. The top third of the dash, door panels, and all the other various bits of trim are a reasonable rubbery material with a nice grain. Anything you touch below that, though, is the kind of hard plastic that Chrysler and Dodge rightly got dinged for in the mid-aughts. 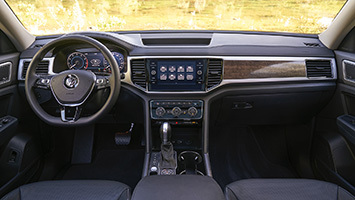 The standard gauge cluster includes an analog speedometer and tachometer, and the available Digital Cockpit replaces those with a 12.3-inch LCD screen but only comes on the top-shelf SEL Premium grade. Making the high-tech gauges optional across the board would help alleviate some of the interior boringness. Check out the quick overview of the Digital Cockpit below, and stick around for a look at the second and third row, the cargo area, and for a comparison of the various trim levels of the Atlas range. There are all kinds of cubbies in which to stash baubles and trinkets in the Atlas, including a generously sized center console up front and deep cutouts in the door panels for the middle row. Third-row passengers are fairly well treated, too, with cup holders and recesses on either side. There's decent room in the way back; a six-footer can sit back there for short rides without hugging his or her knees, even with another equally tall passenger in the middle row. Seven-passenger seating is standard, or, for an additional $625, the middle bench can be replaced with twin captain's chairs. 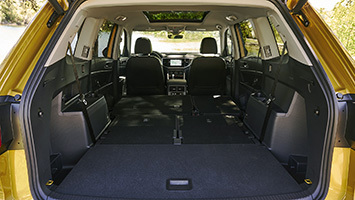 Either way, that middle row benefits from nearly eight inches of adjustment fore and aft to help maximize roominess and cargo carrying capability. Getting into the third row is pretty easy and doesn't necessitate the flexibility of a yoga instructor. 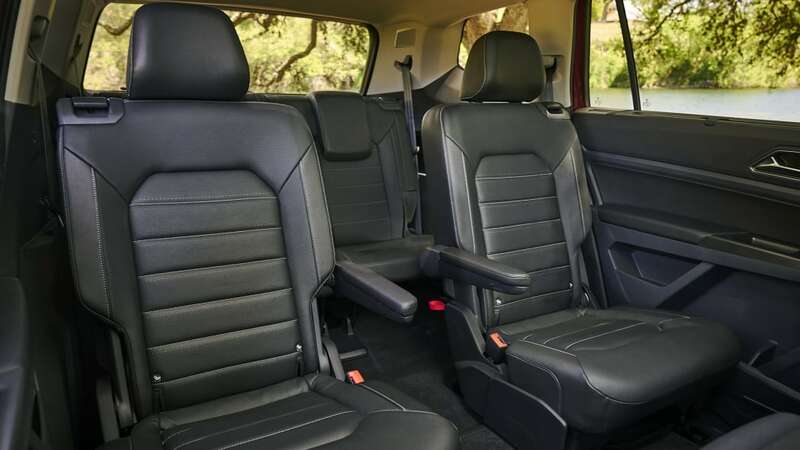 It may be a little harder to get situated in the Atlas than a proper minivan, but ingress and egress of VW's seven-seater is easier than most other crossovers. To give a sense of scale, the Atlas sits on a wheelbase measuring 117.3 inches. That's 4.5 inches longer than a Ford Explorer and 7.5 longer than a Toyota Highlander. 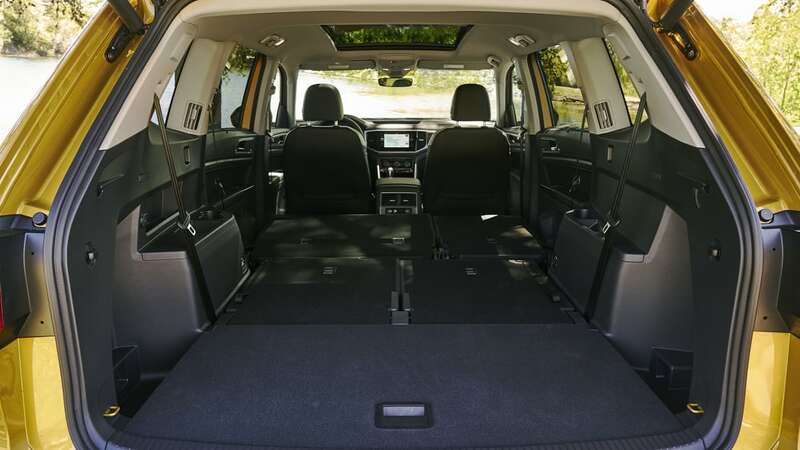 Interior volume stands at 153.7 cubic inches, which puts it right in between those two competitors, but, at 96.8 cubic feet, the Atlas boasts significantly more cargo space than any of its rivals when the second and third row are folded flat. It's worth noting that the upcoming 2018 Chevy Traverse will compete against the Atlas, too, and it'll have a smidge more interior room in nearly every dimension that the VeeDub along with seating for up to eight. 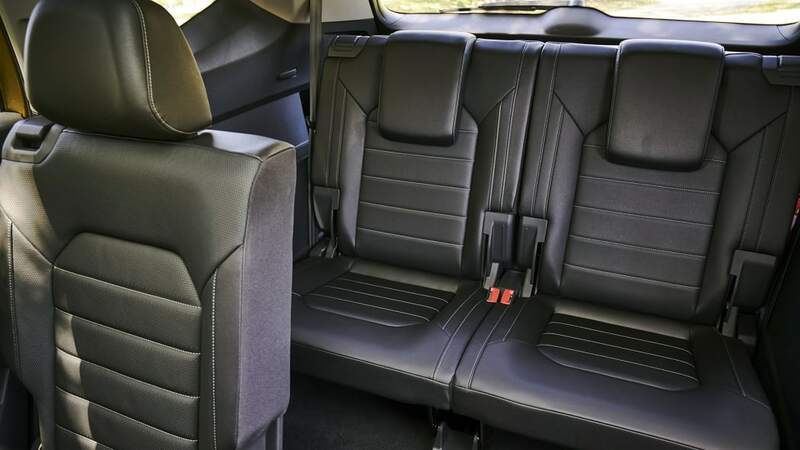 The cabin feels light and airy, more so in light gray than black, though rear visibility suffers dramatically once the massive third-row headrests are in their upper position. Riders in the way back may have to figure out a comfortable place for their feet, since the middle row sits on seat tracks that are raised up off the floor. 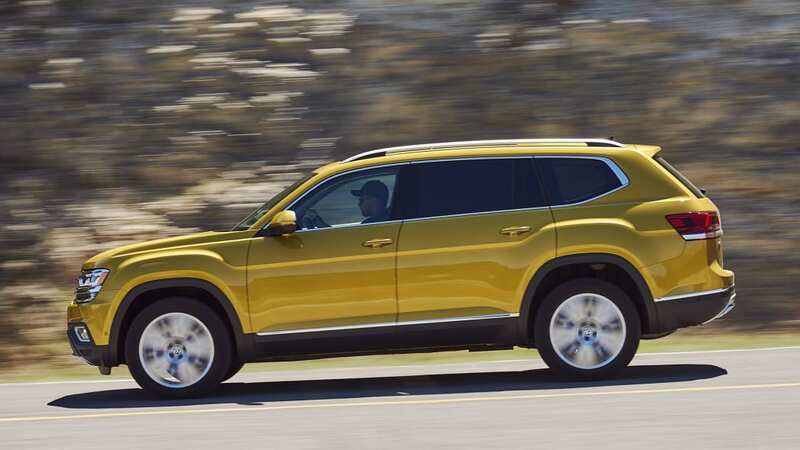 Even with its massive exterior proportions, the Atlas doesn't feel ponderous from behind the wheel. The crossover's ride is taut, with firm damping that helps the driver know exactly what the wheels are doing on the asphalt. The roads in Texas Hill Country suffer from poor paving, which made our drive of the Atlas louder than it probably would be normally. Still, the Atlas may be a bit more cacophonous than the Highlander or Explorer. Steering is good, too, with a reasonable ratio of 16.3:1 and good on-center stability. The rack's assist ramps up at low speeds, making the Atlas more maneuverable in parking lots. Further helping in that regard is the SEL Premium's 360-degree bird's-eye-view camera system. The Atlas' brakes similarly feel up to the task of hauling 4,500 pounds of midsize crossover down from speed, though we never had any significant amount of weight in the vehicle to really put the stoppers to the test. Eventually, the Atlas will be available with two engine options. 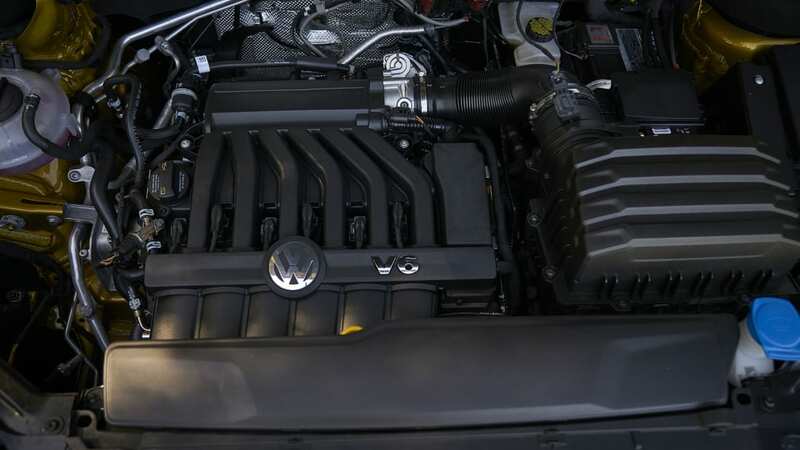 The standard powerplant is a 2.0-liter turbocharged four cylinder putting out 235 horsepower at 4,500 rpm and 258 pound-feet of torque from a low 1,600 rpm (the numbers are slightly lower on regular gas). VW's 3.6-liter VR6 is optional on all trims. The bigger six is rated at 276 hp at 6,200 rpm and 266 lb-ft of torque at 2,750 rpm, and that's the only engine that's available at launch. 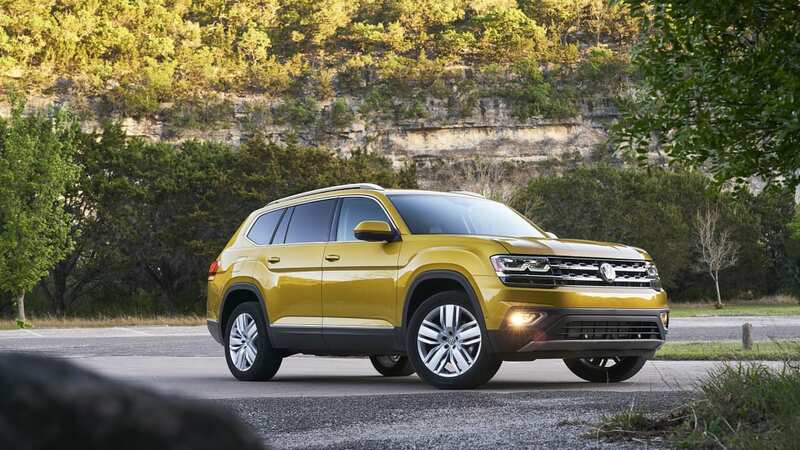 An eight-speed automatic transmission sends power to the front wheels, or all four in vehicles equipped with VW's optional 4Motion all-wheel-drive system. So equipped, a dial in the center console allows the driver to choose from Onroad, Snow, Offroad, and Custom Offroad settings. 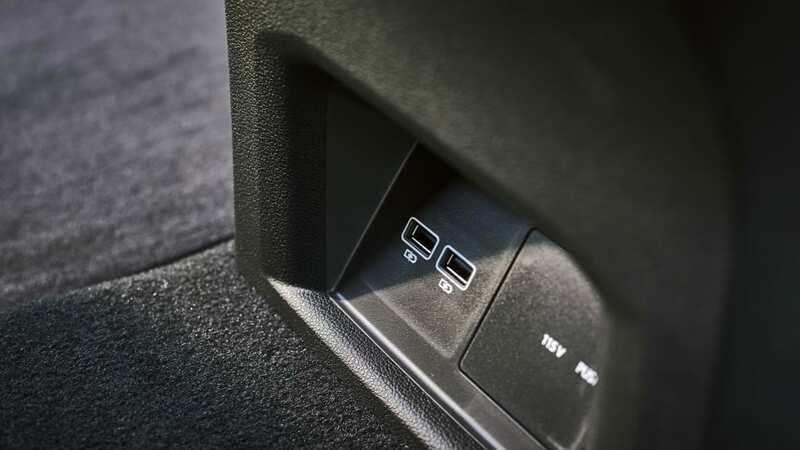 The Custom mode allows the driver to alter the behavior of the steering, engine, and transmission, and the sensitivity of the Hill Descent Assist and Hill Start Assist. In earlier testing, we found VW's 4Motion system worked well in the frigid climes of Quebec's Laurentian region. 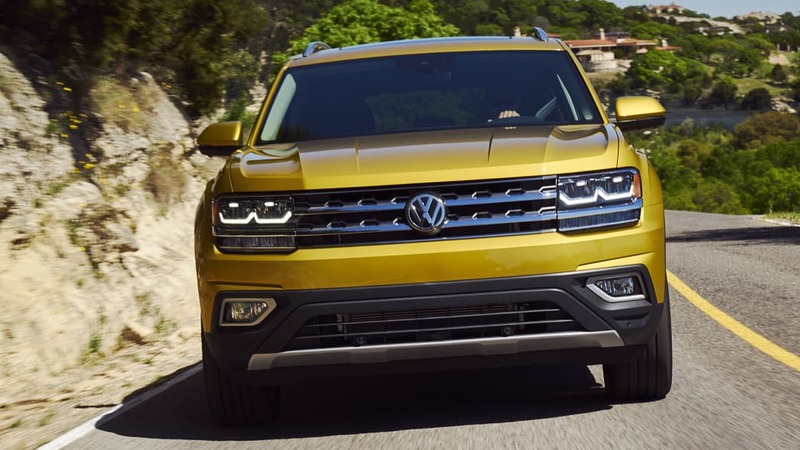 The V6-powered Atlas we tested had adequate power, but there's no hot rod version like Ford offers with the EcoBoost V6 Explorer, and VW's 2.0 turbo is down quite a bit to the 280 hp and 310 lb-ft from Ford's 2.3-liter EcoBoost four. There's a Sport mode for the transmission that holds gears longer when accelerating and forces downshifts earlier, but it's really not necessary. In standard mode, the gearbox is unobtrusive, shifting quickly and quietly enough that we could just forget about it. And we mean that as a compliment. 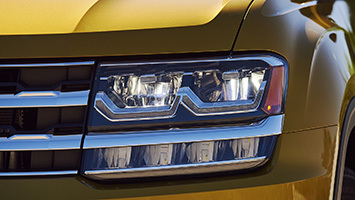 The EPA rates the all-wheel-drive Atlas at 17 city, 23 highway, and 19 combined. That's on the low side for the midsize crossover segment, and down three mpg combined to the Highlander. 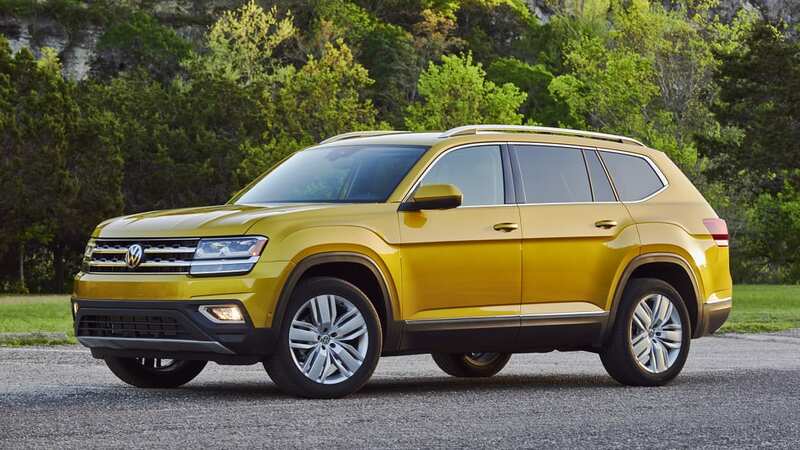 VW rates the Atlas to tow as much as 5,000 pounds, but only if you opt for the factory-installed trailer hitch that's offered on V6 models. All other Atlas models can tow up to 2,000 pounds. That max rating matches the Explorer, Highlander, Traverse, and Honda Pilot. 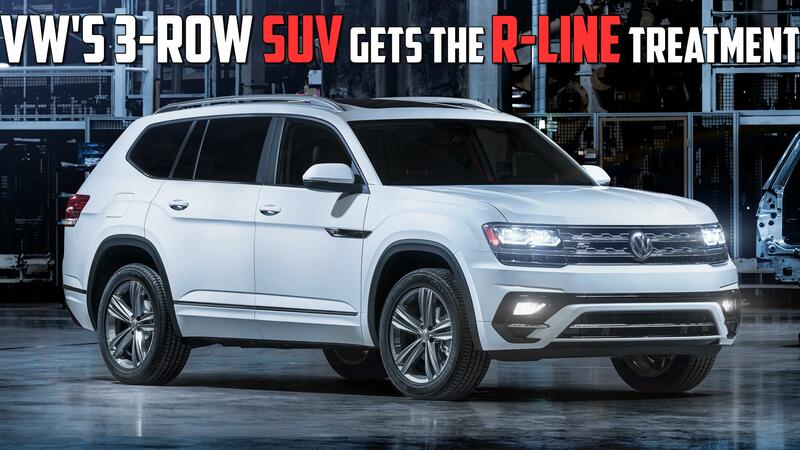 The only competitor that can tow more is the Dodge Durango, which has a rating of up to 7,400 pounds. Standard Atlas S models get LED lights front and rear, a 6.5-inch touchscreen with Apple CarPlay and Android Auto, 18-inch aluminum wheels, and a rearview camera. 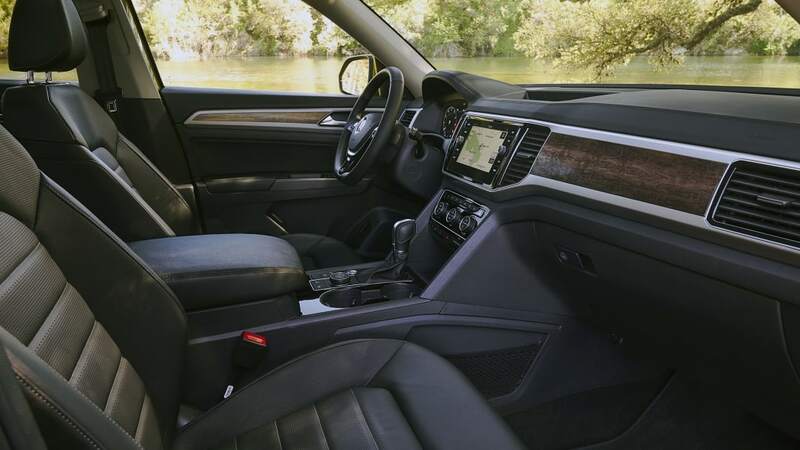 For about $3,000 more, the SE benefits from things like keyless entry, faux-leather seats that are heated in the front, and an eight-inch screen. 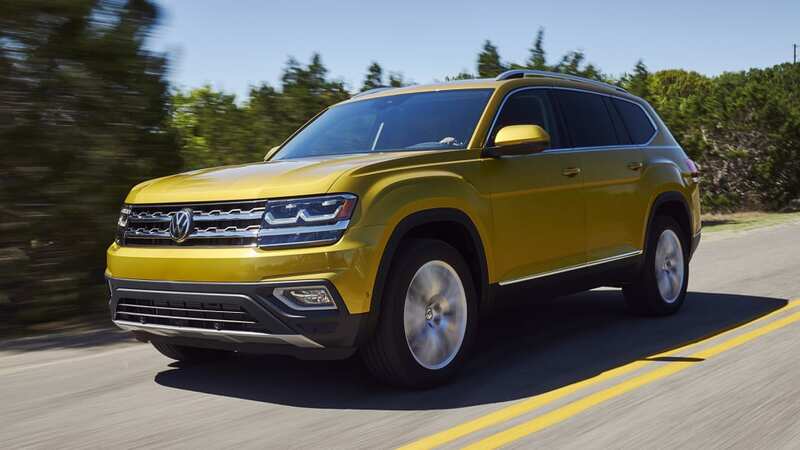 The $36,615 (or $39,815 with all-wheel drive) Atlas SE with Technology Package gets a raft of active safety equipment that includes Adaptive Cruise Control, Forward Collision Warning and Autonomous Emergency Braking with Pedestrian Monitoring, and Lane Departure Warning. We'd like to see most of that safety stuff come standard on a vehicle designed primarily to haul family and friends. 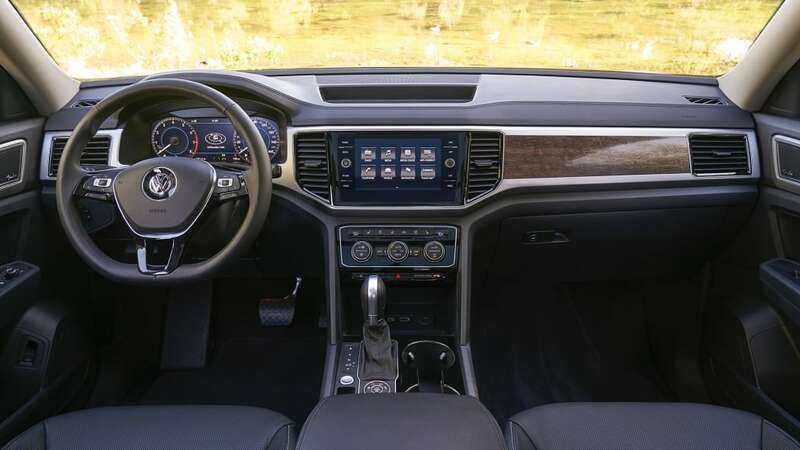 If you can live without any fancy gizmos like that Digital Cockpit, real leather seats, and a 12-speaker Fender-branded sound system, the regular Atlas SEL is fairly well equipped at $40,085 or $43,615 with the V6 engine and all-wheel drive. And finally, the top-grade SEL Premium that we tested rings the register at $49,415 and comes standard with the V6 engine and 4Motion. Some of the obvious cost cutting you'll see and feel in an Atlas might be acceptable at the CUV's starting price of $31,425. 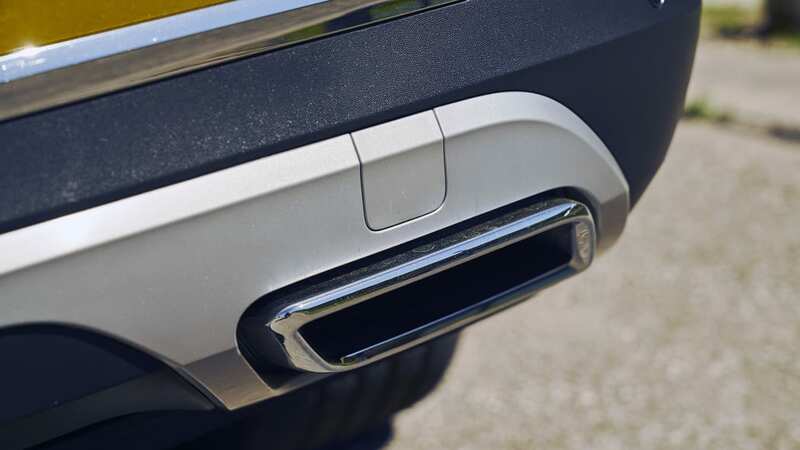 But once the trim level rises and buyers are expected to shell out just shy of $50,000, it suddenly feels objectionable. And that's the main issue we have with the Atlas. On paper, it's a contender with lots of space, an adequate powertrain, good driving dynamics, and a competitive price point. The problem is that the competition looks and feels a notch better, both inside and out, and there's no real gotta-have-it factor tipping the scales in favor of the Atlas. 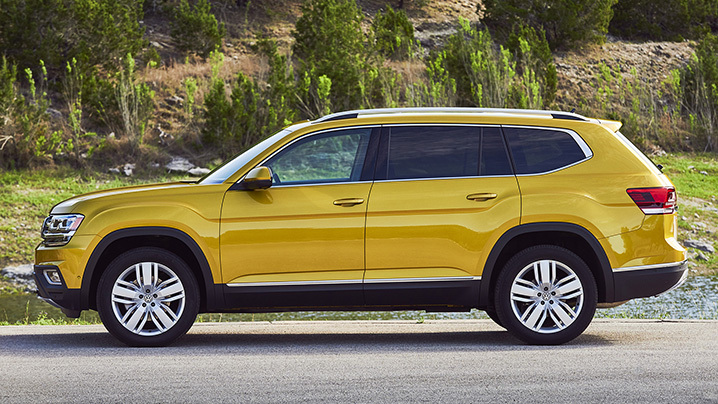 VW needed a credible entry into the seven-passenger crossover segment, and now it has one. But the company didn't break any new ground in the process. We're sure the brand will sell a whole bunch of Atlases here in America, land of the free and home of buyers who base decisions on value by the pound. But we still wish the Americanization of VW's traditionally European-tinged lineup aimed for a lot less bland and a little more premium.